For those who visit or live on the East End, there is a moment when you go to the beach and stop. Stop worrying about text messages, Instagram likes, booking your Soul Cycle class, gluten free menus, receding hair lines or the horrifying moment you made a catty remark and accidentally hit reply all. You are simply absorbed in the rhythm of the waves. Artist Casey Chalem Anderson has spent decades here with a soul connection to the land and sea, using oil painting as her medium. The ocean is a huge inspiration. Anderson comments, “I’m not trying to make the painting an exact photo copy. I’m trying to express what I felt there and what you might feel there.” In a hectic world it is no wonder her large scale paintings of the water or flower-filled farm fields are in demand for people’s homes. “Artwork tells a story to a visitor about what you love and care about, and at the same time you are creating an atmosphere. The ocean is a place where you simultaneously relax and feel energized and where new ideas can spark,” says Anderson. Just walking into her studio in Sag Harbor is a zen moment. You can feel your sensory system calming, absorbing what she calls vaporous veils of color. You could give up martinis if you got to spend time there. If you need a quick fix her blog, “Breath of Salt Air,” offers her images from nature paired with a soothing quote. In terms of scale it is the large works, six feet by four feet, which are currently capturing her imagination. “I’m excited to be making these paintings that are bigger than I am,” says Anderson. She likens the process of painting across such an expanse to dancing, and you feel that energy. Her work has been exhibited locally where a highlight was having her landscapes presented side by side with the famed Fairfield Porter and Neil Welliver at ILLE ARTS in Amagansett. Fine prints of her work are also licensed to different companies including Anthropologie. The Hamptons have a long history with the en plein air style of painting which Anderson still embraces. She recalls setting out on a hot summer day to capture Balsam Farms in Amagansett, “The wonderful thing about going out to paint on site is that you must work at a feverish pace to get it all down. It feels like I’m riding a wave of energy where I’m caught in the excitement of color and the rhythm of brushstrokes and nothing else matters. It’s exhilarating!” Anderson understands on a deep level the need to capture these vistas in a time of vast development on the East End. 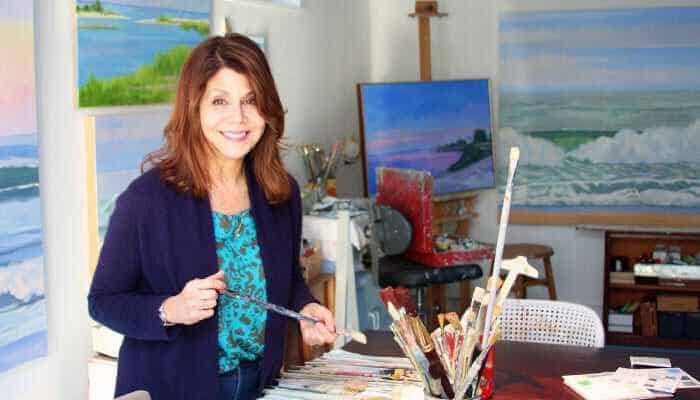 She is a founding member of Plein Air Peconic, a group of artists who wanted to document the land being preserved by the Peconic Land Trust and serve as its ambassadors. Anderson has the honor of being invited to exhibit at East End Collected5 which opens on April 20th and runs until June 16th at the Southampton Arts Center. Paton Miller has curated this selection to celebrate these artists, their inspiration and the collectors who support them. The show is supported in part by Douglas Elliman. In a stressful world, she sums up her personal journey to inner peace, “I attempt many times successfully to access it through the beauty of nature. Particularly the open sky, the reflected sea, and the miracle of zillions of grains of sand that compose a beach. At the beach I’m reminded of my place in the universe, my mind expands.” Deep breath, exhale.